Tulisan Murtad: Islam, Religion of the Sword? 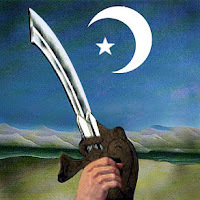 Unlike Christianity or Judaism, Islam's religious history is inseparable from its conquests -- which is why the concept of holy war lives on today. On Sept. 9, I was giving an introductory lecture to my Religion 203 weekend seminar at Iona College. I began as usual with some definitions of some commonly heard terms used in the study of religion. As an example on the term “fundamentalism,” I wrote the word “jihad” on the board. I explained that the word could be interpreted as “religious war,” but that it was perhaps more accurately translated as “struggle,” meaning simply that Muslims were encouraged to struggle for their religion. The entire class wrote what I had said down in their notebooks. Nobody asked any questions. Two days later, I witnessed the destruction of the World Trade Center towers. I was unlucky enough to see it happen from the rooftop of my apartment in Brooklyn. It was my day off from teaching and I had just got out of bed. My Russian neighbor knocked on my door to tell me that there had been an accident in Manhattan and that I should take a look from my roof. So I invited her in and we climbed through the roof from where I had a picture-perfect view of the south tip of Manhattan. It did not seem that bad when I first saw it. An accident, I assumed — bad, yes, catastrophic, no. “Was the pilot drunk?” my neighbor, Olga, laughed. I laughed too. “He must have been,” I agreed. It looked green to me — although I am told now that it was blue, a blue United 767. The morning light played tricks on me and it looked a dark shade of green. It flew over Staten Island and New York Harbor. It looked like it was going to fly up the Hudson River. I do not need to say anymore about what happened next. We have all seen the pictures. The smoke, the chaos and the unimaginable cruelty of the events are the closest I have ever come or want to come to having an apocalyptic vision. I did not believe it had happened, even when I saw the fireball bulging out from the tower. The pandemonium approached the surreal when charred office memos from the towers floated over the East River and landed on my roof. It was letterhead from a company called Marsh, 1 World Trade Center, 98th floor. I looked at it in tears and considered that it might have been in the hands of a secretary in the towers just moments before. Oddly, my neighbors and I decided that the only reasonable immediate response to the attack was to go shopping for food. In retrospect, the idea seems somewhat inane. At the time, however, information was scarce and we did not know what was going to happen. Whatever it was, we were not going to experience it on an empty stomach. We were not alone. Our local bodega was jammed. Several weeks later, when I met my class again, there were many questions about jihad. And not only among my students but also in my own mind. Since the attacks, great care has been taken to emphasize that Osama bin Laden and the al-Qaida terrorist network do not represent Islam or the concept of jihad as presented in the Quran. Everybody certainly wishes that this were true, that Islam is a religion of peace, as the president said, and that the bin Ladens of the world are nothing more than aberrations in the history of religion. This is the viewpoint of James Reston, author of “Warriors of God: Richard the Lionheart and Saladin in the Third Crusade.” During a recent interview on NPR, Reston likened bin Laden and his terrorists to the cult of the Assassins, a medieval group of Islamic heretics who used assassination to intimidate adversaries. “Bin Laden no more represents Islam than [Jim] Jones and David Koresh represent Christianity,” he said. Other scholars and writers, both Western and Islamic, have endorsed the same position repeatedly in the press over the last months. They are challenged by the messages of the terrorists themselves who cite the Quran with as much familiarity as any academic does and who have a vastly different interpretation. Yet, when asked about the origin of jihad as expressed in the Quran, Reston and the others get a bit tongue-tied. There are several reasons for this. The Quran is a notoriously difficult text to understand in some ways. For one thing, it lacks almost any sense of context: Verses are addressed to mysterious Yous and Theys from an equally mysterious We. Moreover, the subject of the verses follow no discernible pattern, moving from questions of jurisprudence to theological and mythological concerns and back again, sometimes without any apparent pattern. For this reason, the Quran has inspired an extensive body of exegetical texts that purport to explain the original meaning of the text. Nevertheless, untangling the original meaning, or creating a distinct context in which to interpret the verses, is a nightmarish problem. Thus the question of what the Quran has to say about jihad, or any other subject, is exceedingly difficult. As could be expected from a document that arises in an environment of unceasing internecine warfare, as the Arabian Peninsula was in the seventh century, the Quran contains no argument for pacifism. To the contrary, it makes conflict a requirement of the new faith. “Fighting is obligatory for you, much as you dislike it” (2:216). Those who remain at home during wartime are repeatedly denigrated as shirkers (e.g., 9:37) and warned that hellfire is hotter than the heat of battle (e.g., 9:81). Some religious texts, including parts of both the Bible and the Quran, are the hermeneutic equivalent of a Rorschach test — their original meaning is so obscure that any interpretation reveals more about the reader than it does about the author. In the same way that the Book of Revelations has been cited as a warning about any world ruler from Napoleon to Ronald Wilson Reagan (count the letters in his name — 666), the Quran can be used to support an almost endless variety of viewpoints and practices. In this case, we may be tempted to go back to the interpretation of the early Muslim community. They lived closer to the text’s original composition, so perhaps they knew what it really meant. I certainly hope not. The unfortunate truth of the matter is that Muslim violence against the civilian populations of other religions goes right back to the origin of Islam in the 7th century A.D. According to Islamic holy texts, Muhammad himself presided over the extermination of the Jews of Khaybar in 629, an event that the Quran calls a “glorious victory” (48:1). (To be fair, some historians have questioned the historicity of this massacre.) In addition, despite the later evenhandedness of rulers like Saladdin, the original Islamic conquest of Jerusalem was a bloody affair, as was the introduction of Islam to North Africa and India. Thus, jihad is historically and textually ambivalent. It could be interpreted as a simple struggle with oneself, like wrestling with your conscience. It could also, however, be interpreted as acts of physical violence against non-Muslims. There might be rules regarding civilian noncombatants — and then again, there might not be. The idea of jihad, like many ideas in the Quran, is a Janus-faced idea with two or more possible interpretations, all supported by scripture. Historically, numerous interpretations have been drawn from the Quran in relation to jihad by different groups with different agendas. A Rorschach test. To an extent, this ambivalence exists in many religions, including Judaism and Christianity. Muslims are not the only ones to have waged wars in the name of religion. So have Christians, Jews, Hindus and Buddhists. The validity of the comparison ends there, however. It seems plain that Islam is confronted by the problem of religious violence in ways that other religions are not. In the world today, the locus of most religious violence is the Muslim world. And Islam is the only religion that has spawned a wandering group of holy warriors, traveling from conflict to conflict fighting the enemies of Islam wherever they see them — in Bosnia, Chechnya, Afghanistan. There is some truth to this, but it does not fully explain the situation. Fundamentalism, as a literal and nonhistoric approach to religious scripture, exists in every tradition, but only in Islam does it go hand in hand with widespread violence. Yes, Southern preachers occassionally get carried away, and yes, Hindu fundamentalists cause intermittent communal violence in the Deccan subcontinent. Neither of these two fundamentalisms, however, has produced the same types of problems as Islam. It is not Hindu fundamentalists or Southern Baptists that generally become international terrorists. What is the difference then between Islam and other world faiths? Is there something inherent in the history and texts of the religion that lead to this behavior? At the core of Islamic history is the fact of the unification of the tribes of Arabia into a powerful medieval military force, one that overran the waning power of the Byzantine Empire and the Persians in the Levant. Islam, from its inception, is a political as well as a religious movement, and the themes of religion, politics and law are inseparable in the Quran and in Islam as a whole. In short, Islam does not have a religious history apart from its political history. This is in distinction from Judaism and Christianity, in which the religious community both predates and postdates the existence of a Jewish or Christian political state. Judaism already exists as a faith in the quasihistorical Age of the Patriarchs (circa 2000-1300 B.C.) before the establishment of the Kingdom of Israel, and Judaism continues to exist and develop as a religious community after the Babylonian Captivity, the Roman occupation, the fall of Jerusalem in 70 A.D. and throughout the Diaspora up to the year 1948. In a similar way Christianity, self-consciously apolitical in its origin, exists for centuries in a Roman/pagan context until the conversion of Emperor Constantine in 325 A.D. This development of the religious community outside of the halls of political power gives both Judaism and Christianity the flexibility to adapt to the secular concept of the separation of church and state that come out of the Enlightenment, and to embrace ideas of modernity and secular civil society. Put simply, neither faith requires the existence of a theocratic state to function fully as a religion because both their origins and endpoints exist above and beyond concerns of statehood. Not so with Islam. The fact of Muslim military might is the rock on which the entire community of the faithful is erected. The Muslim state, with Muhammad at its head, predates the collection of the Hadith (narrations about the life of Muhammad) and the writing of the Quran itself. In Islam, it is not the religious message that promotes the faith into the halls of political power as in Judaism and Christianity, it is an original state of political and military strength that promotes the religious message. Looked at this way, jihad is not a secondary concept in the development of Islam — something grafted onto the original religious message — rather it is the very origin of Islam, the sine qua non of the faith. This furthermore explains the inability of Islamic culture to adapt and accept ideas of modernity and secular government. It is no secret that representative democracy does not take well in the Muslim world. Liberal democracy of the American variety requires the embrace of tolerance over truth, the relinquishment of any binding central religious truth or ideology in government. The very idea of our country arises out of a weariness of the religious wars of Europe. This idea, of a government without a religious vision of absolute truth, is contrary to the Muslim community’s very conception of religious community. And herein lies the keystone of our problems. The attacks of Sept. 11 have created not only a military and economic challenge, but an intellectual one as well. Our dearly held idea of religious tolerance is confronted by a religion that seems at its root, incapable of it. Islam has never existed without the Islamic state, the Caliphate, and it would be hard-pressed to do so now. To accomplish a true secularization of the Muslim world would be to ignore the meaning of the Quran at the core — or at least as it is now interpreted by the most passionate believers. Of course, the untangling of the religious from the political in Islam and the creation of a successful secular Islamic state is not an impossible task. In the years following World War I the Islamic Ottoman Empire eventually became the modern secular state of Turkey, following the reforms of Kamal Ataturk. The metamorphosis required inspired leadership, the deliberate and forceful confinement of Islam to the mosque and the home and the continued vigilance of the Turkish secular government. And other Islamic states have made varying degrees of progress away from theocracy. The problem is that — as the experience of the West proves — the transformation of Islamic societies into ones that accept, to whatever degree, the separation of church and state will take time. After Sept. 11, time seems to be running out. And so certain painful questions must be confronted. Can the world truly continue to tolerate medieval minds with access to 21st century military hardware? Is there really room in the family of world faiths for a religious vision that is terrorist-prone, modernity-proof, plagued by fanaticism and susceptible to the hellish clarion call of jihad? If you think Jihad is an inner struggle against evil, think again, here is from Quran 4:95, "Not equal are those of the believers who sit (at home), except those who are disabled (by injury or are blind or lame, etc. ), and those who strive hard and fight in the Cause of Allah with their wealth and their lives. Allah has preferred in grades those who strive hard and fight with their wealth and their lives above those who sit (at home). Unto each, Allah has promised good (Paradise), but Allah has preferred those who strive hard and fight, above those who sit (at home) by a huge reward;"